Introducing Digital Apnao Vyapar Badhao, a campaign to empower India’s merchants and traders with digital payments. Three simple steps – that’s all it takes to get set up and the Confederation of All India Traders will help you get there. If you want to grow your business don’t miss this workshop! The digital revolution can make Prime Minister Modi’s less cash vision a reality. Efforts of Government of India (GOI) to drive Prime Minister Modi’s less cash vision are timely and much needed to promote both economic growth and financial inclusion. Smart cities, smart governments, smart economies are in the midst of a digital revolution and the digital revolution is intimately entwined with electronic payments. An open and free digital payments market is good for India. The cost of cash is significant. Through payment neutrality and the cooperative efforts among consumers, businesses and the government, Indian society as a whole will gain tremendously by the increased adoption of digital payments. 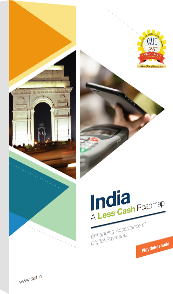 True independence for India is a digital economy free from cash. With less cash, everyone wins. CAIT is determined and committed to enhancing acceptance. The Confederation of All India Traders (CAIT) has organised more than 150 conferences, seminars, round tables and workshops since 2015 in over 30 cities across the country through which it was successful in educating and reaching over 20 lakh traders to adopt digital payments. CAIT continues to make the adoption of digital payments in the pursuit of a better India a top priority. Where we're going, and where we want to be. Making digital payment acceptance a reality for India. Less Cash societies are well known in the world for their positive effects on economic growth as a result of the opportunity to promote financial inclusion. To learn more read the full Less Cash Roadmap book. ©Copyright 2016 – Confederation of All India Traders (CAIT).